30' by 50' INDOOR PLAY AREA FOR THOSE RAINY, SNOWY, COLD AND WINDY DAYS!!! NOTE: Important thing to remember when searching for the right boarding facility; Ask to see the kennel area. This should provide "peace of mind". The kennel was designed on a smaller scale to maintain a more personable and friendly atmosphere. The pets receive attention throughout the day. 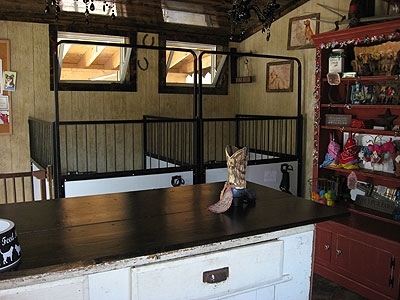 One of the biggest advantages to the DOGGIE DUDE RANCH is the owner lives on-site. This means no matter what time of day or night, someone is here to take care of your pet. There are a total of fifteen kennels. Seven of which have access to 10' by 6' runs throughout the day. The runs are covered, allowing the pets access outside during the day rain or shine. PLEASE NOTE: We cannot guarantee an outdoor run to everyone. They are first come first serve. We CAN however guarantee EVERY DOG will have ample playtime outside throughout the day. NO DOG WILL SPEND THE DAY INSIDE -unless requested. Each kennel is 5-1/2' by 5-1/2' in size. Kennels are very well lit. 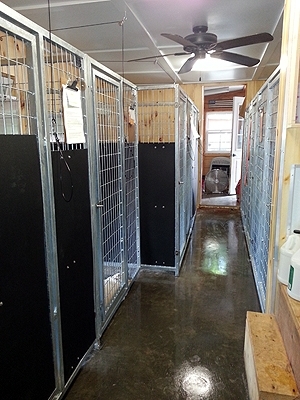 (natural sunlight) Each kennel is separated by a privacy panel. It remains cozy during the winter season. It is heated and well insulated. During the summer it stays comfortable and cool. There are lots of windows for fresh air and brightness. What sets us apart from most surrounding kennels is our large play areas outside! Whether your pet plays well with others or prefers his/her own time alone, they are provided LOTS of playtime outside. Your pet will not spend the day in the kennel. The outside yard includes a wading pool during the summer and sheltered area for those hot summer days. This provides our guests with lots of social interaction and plenty of exercise. Your best friend will come home healthy, happy and eager to return to the "DOGGIE DUDE RANCH"! Please bring your pets food. This is best for your pet. All pets are checked upon arrival for fleas and ticks. Pets showing signs of either one will be treated at owner's expense. Daycare for your pet is available five days a week. Perhaps you work long hours, would like to take a day trip or just want a "dog free day" at home. Bring your pet to the RANCH for playtime with other canine friends! Doggie Daycare provides quality socialization and ample exercise. We reserve the right to refuse service to any pet showing aggression towards staff and/or other pets.